For content marketers, the phrase “Know, Like and Trust” is a common objective. Companies and brands wants to achieve this goal by establishing a benchmark of familiarity with their audience, based on common values and reliability. These days, more people who see ads believe the ads are honest, according to this survey. 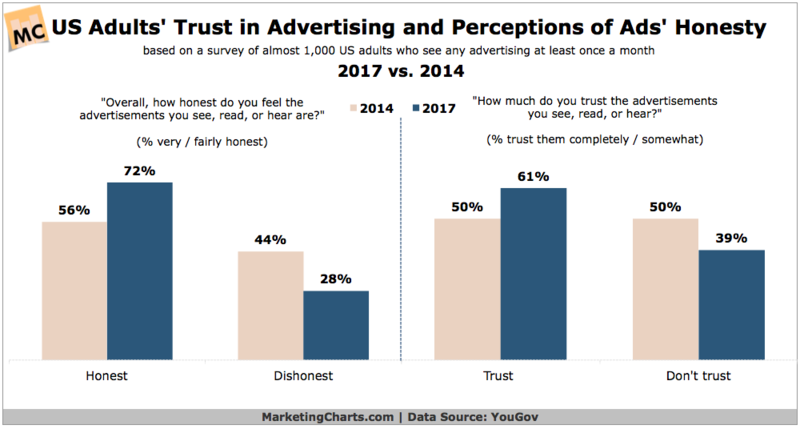 In other words, 11% more people are likely to trust an ad they see today than the percentage of people in a similar survey just a few years ago. What’s going on here? Everyone knows that advertisers try to get your attention in order to sell you something, and people don’t like to be sold to, right? Not necessarily. Consumers don’t want to be “sold to,” but they do like to buy, especially when they’re confident they have all the information they need to make a decision. Consumers expect nothing less than to know, like, and trust the brands they buy and the companies they do business with; and advertisers are rising to the occasion to meet consumers when and where they they’re needed. They’re also placing ads where viewers expect, tolerate, and maybe even welcome them. Most importantly, advertisers are supporting those ads with appropriate content. I believe this is a testament to the efforts of content creators and marketers to provide their readers with valuable content. Since useful content builds trust, the payoff multiplies for companies that run ads in conjunction with good content. They earn their customers’ trust and trust in their brand grows over time. Ironically, institutions that used to enjoy the benefits of blind trust have fallen from grace in the eyes of the average person. Is it any surprise that the three top losers in this poll — those whose perceived honesty plummeted — are government, which doesn’t advertise except in the case of isolated and, ideally, nonpartisan public service announcements; religion, an entrenched institution whose reputation precedes advertising; and the media, which is undergoing the most disastrous fall from grace since the public’s mainstream addiction to it. Now it’s not institutions, but rather companies and organizations that people hold to higher trust standards. People go online for an experience that quickly validates and satisfies their expectations. Because your audience’s expectations are high, you too must send messages that complement and seamlessly integrate with your short-term goals, your users’ or customers’ engagement levels, and your overall brand objectives. How do you satisfy your audience’s expectations of honesty in advertising? Let’s look at some companies and organizations that place ads that cultivate familiarity, likability and trust, and find out what they have in common. People EXPECT their favorite brands and people to do the following. Make an effort to keep your content coffers full and on schedule with the help of a content calendar like CoSchedule. 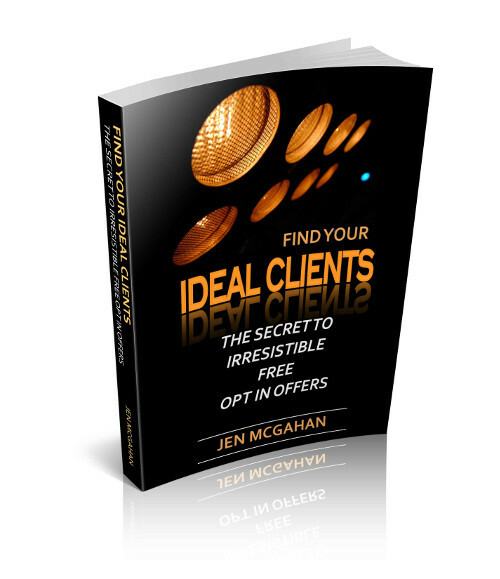 If you blog, set a schedule with content topics that predict and speak to your audience’s inquiries. If you host podcasts, roundtables, or Twitter Chats, make sure you keep to a set schedule and format. 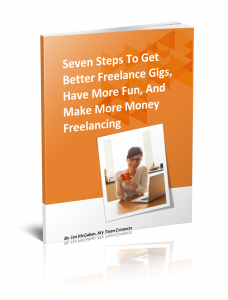 Make use of the online tools available and fold them into your routine. 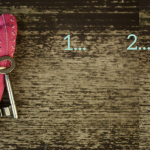 Consistency is actually easier to achieve when you allow your content themes to breathe. Some people fear they’ll lose their main audience if they stray from their core topic, but I prefer to think of content as an opportunity to play variations on a theme, like a jazz orchestra might take turns noodling around a tune. A diverse variety of messages within a theme enables you to connect with people in different ways, which goes a long way toward growing a diverse audience with a common interest. Speaking of diversity, remember that people prefer to consume content in different forms. Your audience is comprised of readers, listeners, and viewers. Consistency doesn’t mean static. Try to provide content that satisfies all the ways people learn: auditory, visual, and sensory. Advertisers that offer a range of content in the form of images, videos, podcast, and blogs reach more eyeballs. Invite others to weigh in. The voices of fellow experts, loyal partners, users, fans and influencers can make for pretty awesome content. A content manager at Blackbaud, Madeline Turner, asks nonprofit experts to chime in on using technology to further their mission, and pulls off a useful and interesting article for the company’s community of software users. It’s also a great opportunity to ask for their input, too. Data and analytics: The topic of privacy is on many advertisers’ and marketers’ minds this week as old FCC privacy rules are likely to stay in effect for the time being. For some, this means that that it’s possible to cross over from trying to understand an audience to almost (ok, literally) spying on them. Internet service providers with access to consumers’ browsing habits will be able to sell that data to advertisers. That’s edging in on creepy (albeit inevitable) if you ask me, but it’s not what I’m talking about here. For many marketers, a worthy goal is attracting the right people, re-engaging current customers and staying relevant in their eyes. One way to transparently keep your finger on your customer’s pulse is to have an opt-in process in place and a reason to monitor and engage with your audience’s actions. Willing participation translates into natural trust. If your community already knows that you operate above a certain self-imposed level, then there are no surprises when they see your ads. Simply asking for permission reaps great returns in trust. Feedback: Getting and giving feedback is difficult. 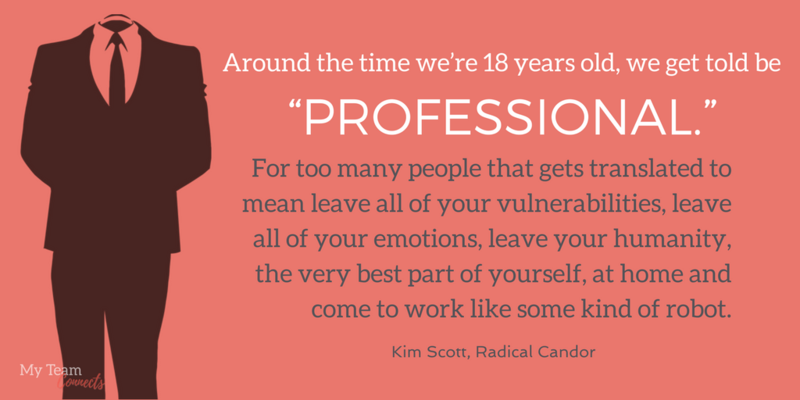 At least it doesn’t come naturally for most of us who were taught to “be nice,” says Kim Scott, author of the book Radical Candor. If processing personal feedback is confusing, how much more so for a large company with multiple products, services and features! Making sense of hundreds of incoming opinions and questions can overwhelm a service team and muddy their efforts to deliver a great experience. In Evernote’s Taking Note podcast, Gerald Hastie shares how the company manages feedback from its community of users. Practices include surveys, user groups, and community questions and answers. All that information is useless if you don’t use it to improve your users’ experience. 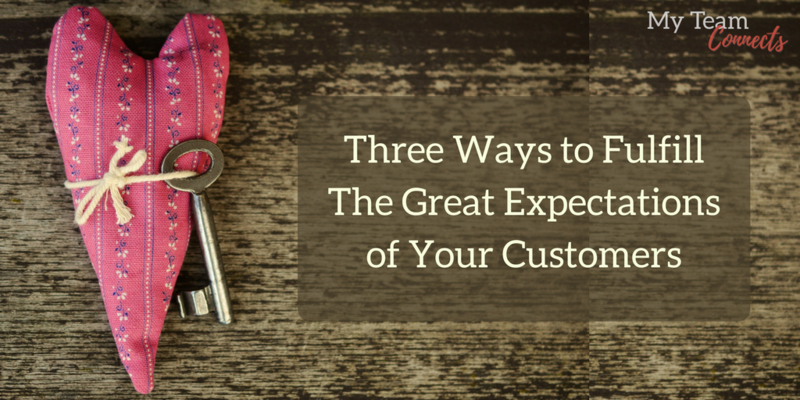 Asking is better than guessing when your goal is to fulfill the expectations of your customers. Trust grows when you ask and follow through with knowledge gleaned from hard-earned feedback. Accessibility: Sometimes the best content is happening right now. If you’re not around, you’ll miss it completely. You’re able now to have real time conversations on social media. Anyone with a phone can host a get together. Storytelling on Facebook Live, Instagram, and SnapChat allows you to meet your audience and instantly harvest feedback on topics your audience favors. Watch a couple minutes of Mari Smith and a roomful of Social Media Marketing world attendees geeking out on Facebook Live with Facebook training. Then imagine how you (or someone in your group who’s a natural like Mari!) could put this easy-to-use technology to work for your company or organization. Effective engagement is inspired by the empathy that develops simply by being human. If you want humans to engage with you, then you have to act like a human. Some say the quickest way to gain trust is through vulnerability. While you don’t have to spill your coffee on yourself to show you’re human, you might share where you’ve learned a lesson, let people know you have a life outside of work, or even act a little goofy sometimes. Authenticity sets you apart. Don’t try to be something you’re not. One of my favorite cartoons shows a dog in 1994 telling another dog, “Hey look, Roger, on the Internet, no one knows you’re a dog.” The next frame show the same dog, many years later saying, “Hey look, Roger, on the Internet, everyone knows you’re a dog.” You can fool some people some of the time, but if you neglect the first two trust builders (and the great expectations of your audience), you’re sure not going to fool them for long! Own up to mistakes. The sad truth is that eventually you are going to trip up. Most of us humans fail in a less public way, but the shame we feel is huge. Maybe you’ll never release a sucky version of your software (Windows XP), hand someone the wrong envelope (Price Waterhouse), or make too-thin yoga pants and charge $98 for them (Lululemon). But a mistake you’re personally invested in probably feels just as buzzworthy. Coming back from failures, even really dismal ones, feeds the fertile ground of growth. It actually makes us strong and brave. In your personal AND professional life, there are times — and it may feel like years — when you’re facing into a strong wind. Remember that everyone gets their share of trouble. 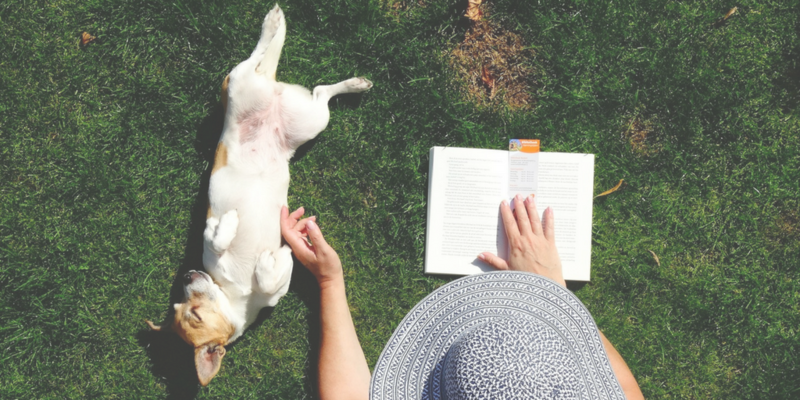 In the world of content marketing, braving mistakes is a great way to build connections with your best, most loyal fans. If you’re taking chances and developing just outside of your comfort zone, then criticism is inevitable. How you handle your critics makes you memorable in the eyes of your audience (because they’re all watching, you know). Jay Baer is a proponent of “embracing your haters to keep your customers.” A bad experience shared online can unravel years of positive work and appreciation. Publicly setting things right with calm, humor, and even a degree of urgency, you’ll probably rebound with integrity and resilience; possibly even winning increased loyalty from your customers. Most people want to cheer a comeback than watch a house of cards fall. Share your wins and strengths as well as your challenges. Even in good times, the head-spinning immediacy and publicity of social media may make you want to sit out for a spell. But your audience expects your presence. Try to stay in the moment, and don’t overthink transparency. The sooner you deal with reality the better. A fortress is a dangerous place. When all eyes are on you and you’re advocating for yourself or your company, avoid telling your version of the story. Focus instead on what you learned. Never forget that while people may be curious about how a blunder went down, your customer mainly wants to find out what’s in it for him. Relax. Breathe. Shake it out. Lose the uppity voice, the jargon, and inclination to pontificate. Not that you’re guilty of any of that, of course! It’s a process, but it’s one you can easily get good at, if you strive to know, like and trust your customers the same way you want them to know, like and trust you. Remember your objective. To earn your customer’s trust and fulfill their expectations, you first have to be there, with consistency and an understanding of their needs and desires. In the end, content marketing is a two-way street.